The dinghy is a valuable piece of equipment aboard Rode Trip. We’ve had our Avon inflatable for three years. It was perfect for the short paddle out to Rode Trip when she was on the mooring back in Portsmouth, New Hampshire. After a day’s sail we’d paddle back to shore, deflate the dinghy and roll it into the back of Brian’s Subaru Forester. Once we’d moved aboard Rode Trip, however, the distances to be paddled became longer and longer. Within our first four months of cruising, we were finally able to add an outboard to the dinghy. We found our Nissan 5-horsepower, two-stroke outboard at a marina yard sale in Cape May, New Jersey. Thankfully, we’d had friends with us at that time (Matt & Jessica, s/v Serendipity) who already had a motor powered dinghy in which we could transport our new outboard back to the boat. I’ve always wondered how we would have managed that with the two kayaks… Thus, we had a powerful (insert chuckle here) motorboat that could not only ferry us to and from shore but could also ferry all of our stuff and family members and friends. Friends who have experienced the power of the dinghy have referred to it as, “The little dinghy that could.” The dinghy has also been named, appropriately to accompany this Rode Trip as, “Sidecar.” Most often, especially during wet rides, one may hear me very affectionately exclaiming, “I hate the dinghy!” Without this mass of rubber and accompanying outboard, though, we’d be stranded. Or, consequently, we could have totally jacked arms from paddling kayaks for several miles. When the outboard choked, it became the top priority on The Checklist. The outboard got loads of attention during our stay in North Carolina this past year. Brian with the assistance of our friend Ren (s/v Nila Girl) had replaced seals, cleaned the carburetor, and basically gave the outboard a good tuning. To our knowledge the engine was in good working order. We had just made two trips to shore with ease, here in Long Island, when we boarded the dinghy for the third time to join friends aboard s/v Ramone for dinner. Ron, Simone, Kim and their guests had invited us to share a meal with fish and crab that Brian and Ron had speared earlier that day. Brian fired up the dinghy outboard…VVVVRRRRMMMMM…and popped it into gear…Vvvrrmm…the engine stalled. Repeatedly Brian started the engine, put it into gear, and the engine stalled. All the while we were drifting toward s/v Ramone and Ron came out in his dinghy to rescue us. Ron first asked for me to hand him the brownies. Then, he asked what seemed to be wrong and immediately started trouble shooting the outboard issue. Ron’s quick assessment was that something was amiss with the carburetor. 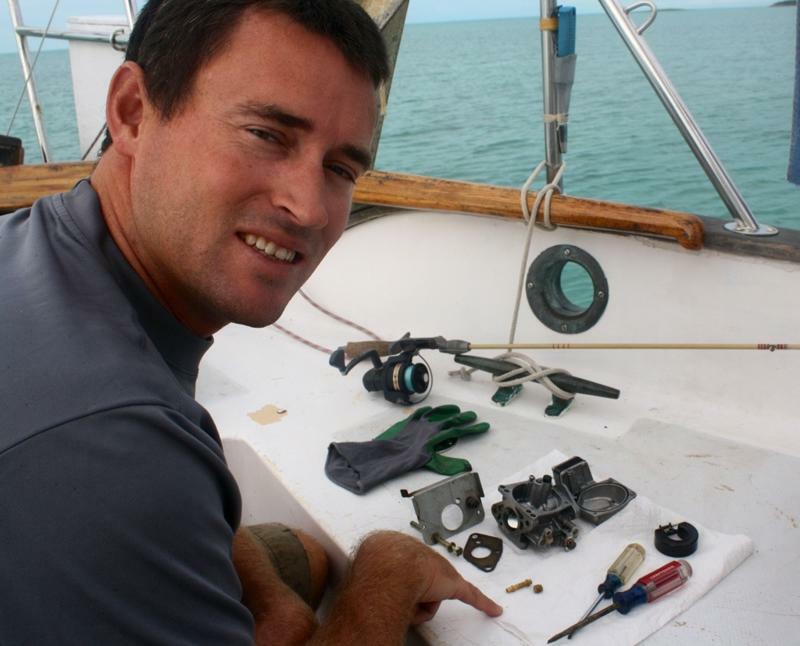 The next day, and consequent two days thereafter, Brian disassembled the outboard. First, he took out the fuel tank and inspected the interior to ensure it was not rusted. He cleaned the filter that protects the fuel line. It was quite dirty. Then, he disassembled the carburetor to inspect and clean all the parts. Finally, he purchased new gasoline just in case we had gotten a bad mix. He could now run the outboard by adjusting the choke just when the outboard sounded as though it was going to stall. Not ideal, but we were able to putter around for the time being. Again he conferred with Ron as well as our friend Phil (s/v Changes). Again they’d determined it was an issue with the carburetor. Brian reviewed the diagram for the carburetor and again disassembled the part. Inside, he discovered that there was a very small piece of debris in the carburetor jet. He removed the debris and reassembled everything. Now the outboard is running like new! This entry was posted in Uncategorized and tagged 5hp, carburetor, gas, gasoline, Nissan, NS5B, outboard, two-stroke by stephanie. Bookmark the permalink. 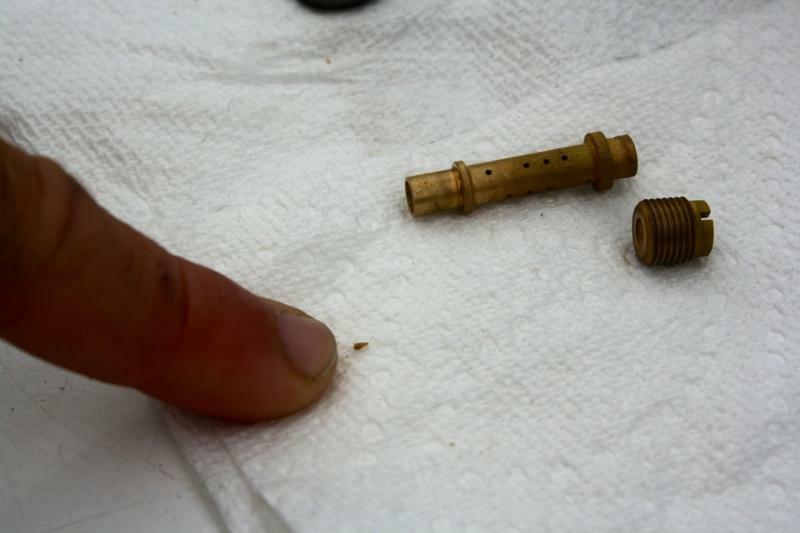 Glad you found the problem; working with carburetors can be a humbling experience. As soon as you think it is fixed; it is choking again. Usually it happens as you are drifting in a busy channel. Have fun! You are missing snow. As I first started to read this blog I thought to myself that this story was going to end horrific death of the out board. I’m glad it was just a little dirt in the jet! Step, I laughed at your comment ” I hate the dinghy” . I when I read that it was as if I was there with you and your tone of voice was sooooo dramatic. Its always a wet ride in the dinghy.